"Anyone who fights us is either stupid or on Saren's payroll. Killing the latter is business. Killing the former is a favor to the universe." This exceptionally detailed statue stands 23-inches tall! Limited to only 1000 pieces worldwide. "Anyone who fights us is either stupid or on Saren's payroll. Killing the latter is business. Killing the former is a favor to the universe." Gaming Heads proudly presents the Wrex 1:4 Scale Statue, the next collectible statue produced from Mass Effect! Standing approximately 23-inches tall, Wrex is depicted grasping his trusty Graal spike thrower shotgun atop a rocky base. Cast in polystone resin, this impressive staue is limited edition to 1,000 pieces worldwide and is hand finished and hand painted to the exact standards you've come to expect. 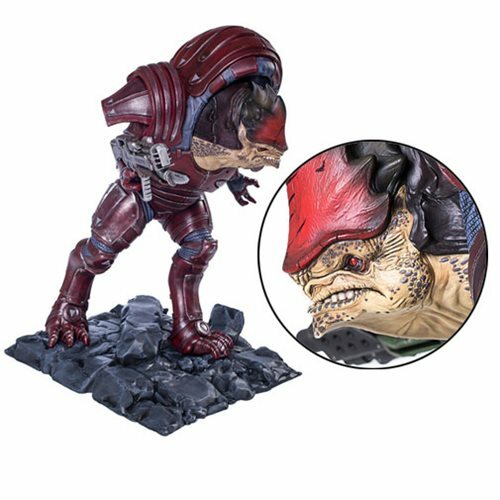 This Mass Effect Wrex 1:4 Scale Statue comes in a deluxe full-color box with an individually hand-numbered base and certificate of authenticity. A famed krogan mercenary and bounty hunter, Urdnot Wrex is also one of the last Krogan Battlemasters: rare individuals who combine powerful biotic abilities with the devastating firepower of advanced weaponry. Despite his chosen path of violence and killing for credits, Wrex is deeply concerned with the fate of his people after the genophage, and is one of the few planning for a new krogan future.